The Small Enterprise Foundation (SEF) is a not-for-profit, pro-poor micro-finance institution, in South Africa. SEF helps South Africa’s poorest communities, through women, to improve their lives and escape poverty by helping to provide access to appropriate financial services (such as small loans and savings accounts), new ways to generate income, and important information about their health, crops, income generating opportunities and finances. Modelled on the Garmeen Bank of Bangladesh, founded by Nobel prise winner Muhammad Yunus, the SEF has been operating successfully since 1996. Expanding sustainably, village by village, the SEF now have 55 branches supporting over 95 000 active clients. That means 95 000 women from profoundly poor communities who now have some form of micro enterprise and are able to provide for themselves and their families economically. Through its successful model the SEF is now 100% self sustaining and employs over 500 people. Every $ & £ donated to the SEF is used directly to provide micro finance to these women. They are able to leveraged the money 4 times, meaning every $1 donated creates $4 which these women can borrow to start or expand an income generating enterprise. The SEF’s mission – to give people the means to build their way out of poverty—resonates because it touches on a simple truth: Each of us has the power to change the world, and each of us has a responsibility to try. I know and believe in this truth and I believe you do to. So do the SEF’s 95 000 borrowers, scattered across rural villages in South Africa. The SEF makes tiny loans to the poorest women in the country, giving them the opportunity to start or grow their own businesses without resorting to predatory loan sharks. They also provide basic money management and financial literacy education and require their borrowers to save, ensuring that the business is sustainable and that the relationship with money is healthy. Women make up 100% percent of the SEF’s borrowers and, despite 95% of the borrowers being illiterate and innumerate, have proven to have a unique ability to lead their families out of poverty. The SEF requires no credit history and no collateral. It doesn’t take people to court when they’re late on their loans, and it doesn’t seize their property. Despite this, it has one of the lowest loan default rates in the country. What’s their secret? Harnessing the power of sisterhood. Collective accountability, appropriate support, independence and focus on self-empowerment. Each borrower must form a group with four other women who must also start a business. The group borrow and save collectively creating a powerful support structure and collective will to succeed. Each group belongs to a Centre made up of 8 to 10 groups. The members of the centre elect their own management structure and decide on their own operating principles within a framework set by the SEF. Fortnightly meetings are compulsory to ensure businesses are functioning and that both savings and loan repayments are or track. If a person or group is struggling the Centre collectively find a solution. Between 10 and 15 Centers fall under a Branch. The SEF lends only to women as over time, the SEF’s managers found that women could make the most of the loans in a way that engaged their communities. They managed the household and made purchasing decisions for their families. They made good financial decisions, saved more money, and were better able to pay back their loans. These same women were turned away from traditional banks and told that they were too poor. With the SEF, they can stand up for their own interests. Here are just two stories as examples of the amazing work being done. Born in 1954 in the small village of Sehlakong in Limpopo Province, Masale Modika is the second child and eldest daughter in a family of eight kids. Both her parents were uneducated and unemployed. She never had the opportunity to attend school, being the oldest daughter her mother counted on her to not only help with with their farming as the only way to feed the family but also for keeping the home and taking care of her younger siblings. Life was hard. Masale married at 25 years old and was blessed with a baby girl. Her husband was working but did not support her at all, they were living in a tin house and a small mud structure that was used as a kitchen. Masale’s husband left his family when their daughter was only five years old leaving Masale and their daughter destitute and looking for ways to survive. Masale started making the sorghum beer (Umqomboti) to make ends meet but the business didn’t go well. To try make some money she would sometimes do housework for a local woman who was a dressmaker. She learnt a lot from the woman just by observing how she as sewing. As Masale was moving about the village she used to see women gathered under the tree, one day she asked someone what those women were doing there. They explained that they were members of The Small Enterprise Foundation. 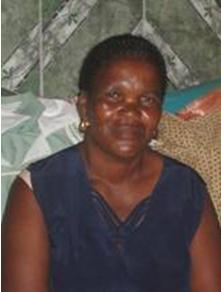 She joined SEF, formed her own group and received a loan of just US$75 (R800). She bought an old model Singer sewing machine and some material and started sewing clothes and curtains for people. 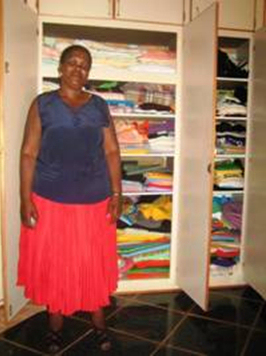 As time went by and the business grew she started selling blankets, sewing materials and boxes of washing soap. Wanting her own home, she decided to make her own bricks and bought a brick making machine. In no time people noticed how good her bricks were and started buying them from her. 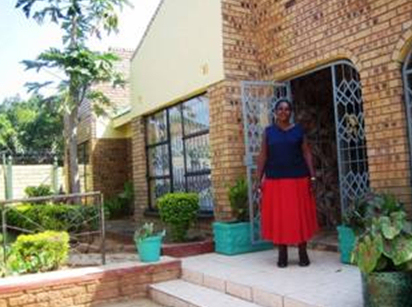 She now has a second successful business supplying bricks and has 14 employees. With the structure, support and savings mechanisms provided by the SEF, Masale’s business continued to thrive and expand. She is now on her 7th loan cycle and is currently borrowing US$1000 (R12 000). Masale’s businesses are successful, she provides well for herself and her daughter, she build herself a beautiful house and bought two cars. She proudly shares that in her bank account she how has more than US$11 000 (R113 000) and in another account she has US$5 000 (R 50 024). Her life is now something that she never dreamed it could be. Born in 1976, Lester grew up in a very poor family, with a single female parent and her four siblings. She has three older sisters who are married and one older brother who lives in Johannesburg and seldom visits home. Her mother worked at a lumber/timber manufacturing factory and what she was earning was so little that she could not afford to pay Lester’s school fees and so she had to drop out of school. Her sisters got married young to run away from the poverty and her brother also left home to find a job. Lester was now staying at home with her mother and two of her sister’s children. Staying at home was very frustrating and desperate to find a way out she started dating and fell pregnant in 1997. Her mother was very angry and disappointed by her daughter’s actions and that she failed to see how much she was already struggling just to feed them. Lester’s mother was almost at her retiring age so advised her daughter to look for work so that she could take over from her in caring of the family. Since she was not educated the only job she could find was working as a domestic helper. She worked for five years and fell pregnant again. At this point her mother was now retired and seeing that she had one more mouth to feed and her wages were not enough for the whole family she then looked for work somewhere where they would pay her a little more than what she was earning. She was fortunate to be hired where her mother used to work. Her earnings and her mother’s pension fund were helping the family and getting the children to school. The situation was not improving at all, everything was getting more expensive, food, clothes and her travel costs to work. They were only affording the essential things which to them it was better than nothing. All became worse when her mother became ill and passed away. There was nothing easy in Lester’s life, nothing to be happy or smile about. Poverty made her so vulnerable that she would easily fall for men whom she thought would take care of her just like her brothers-in-law were doing for her sisters. Two years after her mother passed away she got pregnant with her third child. She was falling prey to men who at the end wanted nothing to do with her or their young ones. Her mother was no longer there to look after the little baby so she had no choice but leave work. Lester was now left without any income and taking care of her nephew, niece and three children. After letting her sister know that she cannot survive the heavy responsibility she was carrying alone, her sister took her daughter back but her teenage son refused to live with his mother as he was not getting along well with his stepfather. Lester and her little family became a charity case, she was begging from strangers. After some time SEF started its operations in Bushbuckridge where Lester lived. Hearing about their work she decided to join other women to improve her life. 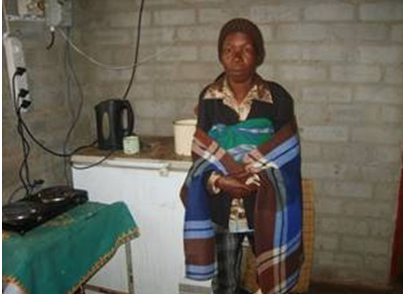 She asked for US$90 (R1 000) on her first and second loan which she used to buy paraffin and steel wool to sell. It was her first business and was thrilled to see it thriving and changing her life. 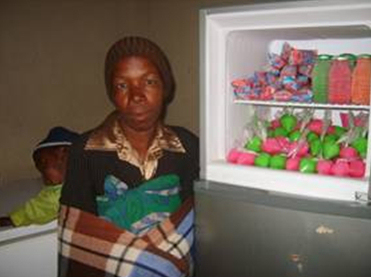 On her third loan she asked for US$65 (R700) which she bought frozen yoghurts and juice to make ice blocks, she says this is a good business especially in summer.